Gary and I went away for the weekend. We were at a lake and there was little to no cell phone service. It was nice. I needed a break. I took the weekend off from taking pictures, blogging, tweeting and texting. I took about 5 total pics. While I am sad about it, and not having pics of our memories, I am happy that I relaxed! We went on a night time boat ride with a handful of our friends. The moon was full...it was so pretty. We rode on one of the 5 jet skis we had at the boat dock. I had a GREAT time hanging out with my friends and husband. We ate greasy cheeseburgers from a little hole in the wall restaurant near the lake. We got breakfast burritos in the morning, and we ate chips and dips for lunch. It was wonderful...a total break for me...no cooking...gasp! The kids wanted to ride the jet skis so badly, but they had to stay behind at Auntie's house. They finally got to climb on the skis on Sunday morning when we picked them up. I couldn't imagine getting back on those monsters. I am still sore from riding them and it is Monday morning! My little Hayden turned two yesterday. After his bath he was climbing on it. He really isn't sure what to do with it. HA! Boys will be boys right?!? We had a wonderful weekend away, but came home to quite a mess here at home. Apparently a lightning storm rolled through our neighborhood on Friday evening. Our house and our neighbors house felt the effects of that. We have LOTS of things not working. I am so bummed out. Just to name a few, our TV in the living room, our land line phones, our security system, the Wii, and even another TV in another room doesn't function properly. Never a dull moment in our household. click on the link above to go read other bloggers miscellany monday posts! happy (day late) birthday to handsome hayed! his trike is so cute! the weekend getaway sounds amazing! have a happy day and thanks for joining... i love to have you! shoot! i have auto spell check on and it changed hayden's name automatically... so i really do know how to spell it!!! so sorry! Ooh, a trip away sounds very nice, including just relaxing and not taking pictures. 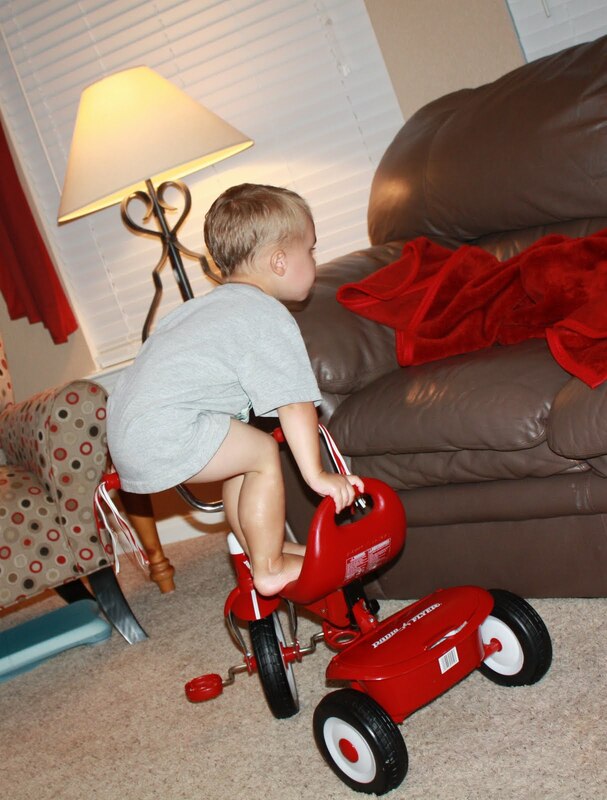 I love the pictures of Hayden and his tricycle...he'll be a champ on there in no time. There was a bad lightening storm here and a co-worker lost power like that. I hope things get fixed soon! I noticed you hadn't tweeted much this weekend! I'm glad you had a nice relaxing technology free weekend:) Happy Birthday to Hayden! 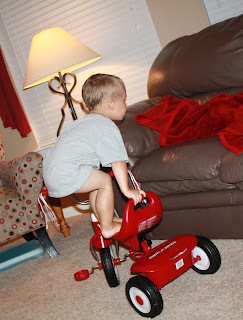 I love the tricycle pic with him climbing on it...that is just what my boys would do. Your trip sounds wonderful and the picture of the lake is so pretty. Sorry you came home to things not working. Hope they all get fixed soon. Happy 2nd birthday to your little man! It's so nice to not have to try and take pics all the time...I enjoy having those moments captured too, but enjoy not worrying about getting pictures! Sounds like a great getaway! So glad you could enjoy it with good friends...but so sorry you had to come home to some chaos :( Isn't that the way life works, bummer! Hayden is so cute! I love how he found his new trike to be a climbing toy, haha! Enjoy your week, I hope it stays cool! I just put a tricycle on Jack's 2nd Birthday wishlist. I can't wait to see him enjoy it as much as Hayden. angie i hope you had a great weekend getaway!! those are always the best!!! i'm gonna try and get back to bon appetite next monday!!! have any ideas for a topic?? I am glad you all had a nice time away. It is good to get away from it all sometimes! Happy Birthday to Mr. Hayden!!! Sounds like y'all had a great weekend. I could really go for one of those "kidless" weekends right now! Ha! Glad you got a nice weekend away! Hope things at home get back to normal soon!